The 2016 season climaxes with East defending its Class 4A crown against Springville, which last made the finals in 2009. Lone Peak returns to the 5A title game for a second straight year and faces Bingham, the 2014 champion. The Class 3AA final pits Desert Hills and Pine View, reprising the 2013 championship contest, won by Desert Hills. That’s the last time both those teams appeared in the finals. Bingham is back in the title game for the third time in four years and for the sixth time in nine seasons. East returns for the fourth time in six years. East tries for its 18th championship and Bingham for its 10th. But Desert Hills, Lone Peak and Springville each search for their second, while Pine View seeks its first state trophy. 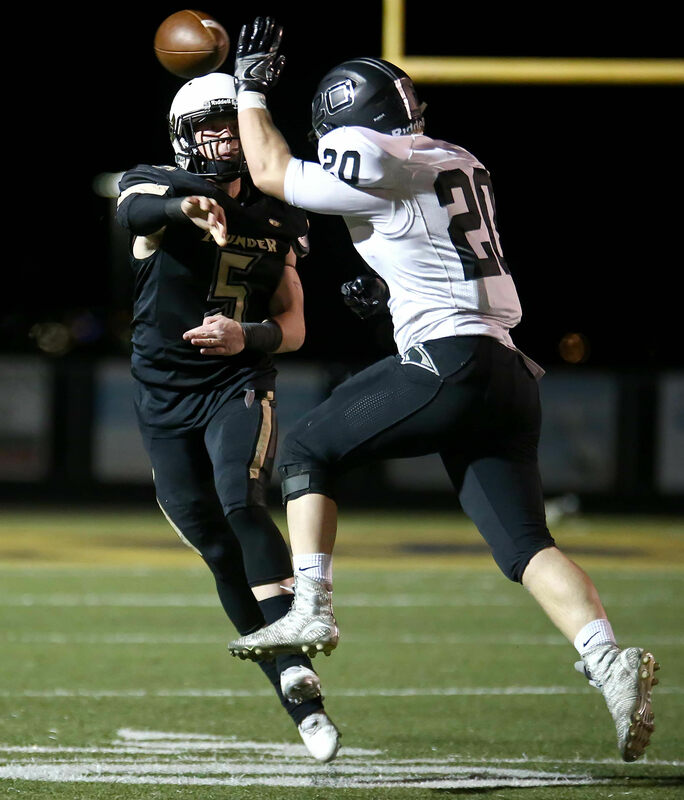 Of the three matchups, only Desert Hills and Pine View have met before to decide a state championship – that 2013 encounter which Desert Hills won 27-21. East and Lone Peak suffered losing seasons in 2014 and Desert Hills went 5-5 last year. Meanwhile Bingham enjoys its 13th straight winning season, the longest streak of the teams playing this week. East (13-0) hopes to remain undefeated for the first time since 1996 and win 14 games for the first time in its 103 years of football. Bingham strives for 14-0 for the third time in its 93 seasons and first time since 2013. Springville has matched its school-record 12-0 season of 1985, the Red Devils’ only undefeated campaign – and championship – in its 100 years of football. Two of the six coaches in this week’s finals have won a state championship: Desert Hills’ Carl Franke (2013) and East’s Brandon Matich (2015). Lone Peak’s Mike Mower directed the Knights to the title game last year and Pine View’s Ray Hosner has the Panthers in the finals for the fifth time in his 16-year career. The other head mentors, Bingham’s John Lambourne and Springville’s Willy Child, advance to the finals for the first time. The East-Springville clash for the Class 4A crown marks just the 19th battle between undefeated, untied teams. That’s out of 290 championship contests spanning the years from 1919-2016. It’s the first one since 2014 when Timpview knocked off Roy, also in Class 4A. This season features three championship games that reprise regular-season bouts: Duchesne-Kanab, Desert Hills-Pine View and Bingham-Lone Peak. Of the 290 championship games, 128 have been rematches of regular-season games. That seems to be a surprisingly high 44-percent. But with more classifications resulting in fewer teams in each class, season rematches in championship games will likely become more common. Through 2015, the loser of the regular-season meeting has gained revenge 47 times in 125 past attempts – that’s nearly 40-percent of the time. Last week, Duchesne did it for the 48th time. In addition, Duchesne became just the 13th team to avenge its only loss of the season in the championship game and the first since Manti beat Juan Diego for the 2A crown in 2003. Lone Peak, with its only setback this season to Bingham, hopes to become the 14th by defeating the Miners. Meanwhile, Pine View suffered two losses this season and has already avenged one of them by knocking off Dixie in the semifinals. They can gain revenge for their other loss, to Desert Hills, in the championship. The last two-loss team to avenge its losses in the playoffs was Desert Hills, in 2013, when the Thunder beat Dixie in the semis and Pine View in the finals. 290 Title Games but 322 State Champs? Friday’s nightcap, the East-Springville game, is the 290th championship contest since 1919, but the winner is the 322nd state champion. That’s because before 1919, state champions – 21 of them – were awarded trophies based on which team had the best season record. Then, in the 1920s, ties in the finals and semifinals, too, resulted in multiple champions some years. Fans at last week’s Class 2A title game saw Beaver’s Jordan Hardy explode for a 96-yard run, a state championship-game record. Including that feat, five championship-game records were set last week, all by individuals. Also, Duchesne’s Ammon Graehl scored on an 80-yard interception return, the longest pick-six in championship history. But it isn’t the longest interception return: Roy’s Larry Riggs ran 88 yards, but didn’t score, on a return in 1981. Juan Diego coach John Colosimo snared his seventh state title, moving him into a third-place tie with Dunn “Snyde” Taylor (Jordan) for the most championships won among all-time coaches. Only Roger DuPaix (Skyline) and Al Marshall (Beaver) earned more state trophies – eight each. Duchesne’s Jerry Cowan took home his fourth crown. Just 13 coaches have won more championships in Utah prep football history. Beaver’s Randy Hunter became only the seventh coach to win championships at more than one school. (No one has won at three.) Hunter also directed Enterprise to a state crown in 2003. Before Hunter, the most recent coach to win at two schools is Blaine Monkres, who picked up one title at Morgan (1993) and two at Dixie (2012 and 2014). Beaver throttled South Summit 55-35 in the 1A final last week and those teams’ 90 combined points are the most in a regulation-length championship game. That total is the second-most all-time to the 93 scored by Davis (50) and Cottonwood (43) in overtime in 2004. In addition, only three teams have scored more points than South Summit’s 35 and lost in the title contest. This section appeared in last year’s Felt’s Facts, but warrants inclusion again since the college field where semifinal and final rounds are played has different hash-mark dimensions in comparison with prep fields. Some may feel that prep kickers are disadvantaged by the narrower goal posts on a college field – 18 feet, 6 inches versus 23 feet, 4 inches on a high school gridiron. However, the distance between the hash marks – the outer limits of where the ball is put in play – is also narrower, so players have a more direct kick toward the goal posts. In prep football, the hash marks evenly divide the field into thirds, so the marks are 53 feet, 4 inches apart. On college fields, the hash marks are 40 feet apart (and 60 feet from the sidelines) giving more room along one sideline to spread out the defense. NFL gridirons have the hash marks line up with the goal posts, thus making the distance between them just 18 feet, 6 inches apart and a whopping 70 feet, 4 inches from the sideline. Another way to look at it: one-third of a high school field lies between the hash marks, one-fourth of a college gridiron and just about one-ninth of a pro field. In 1972, the NFL moved the hash marks closer together, “looking for a way to produce more action and more touchdowns. Putting the ball in play farther from each sideline supposedly gives the offense more room to exercise its options,” according to Sports Illustrated. Series history: They’ve met seven times, the first four as region foes, then twice in the semifinals and in a non-region game this year. Bingham won the first two encounters in 2007 and ’08, but Lone Peak retaliated in 2011 and ’12. The Miners grabbed the 2013 semifinal battle, but LP avenged the loss in the 2015 semis. This season, Bingham doubled up on the Knights 42-21 during Week 3 (Sept. 2) at Lone Peak. Series record: Bingham leads 4-3. Coach vs. coach: Bingham’s John Lambourne and Lone Peak’s Mike Mower are tied 1-1. Current winning streaks: Bingham, 13 (second longest active streak); Lone Peak, 10 (only loss was to Bingham). The Miners began their football program in 1910, but after compiling a 3-2 record against such teams as Collegiate Institute and Liberty, as well as Jordan, Park City and Payson, Bingham took 14 years off before resuming in 1925; the 2016 season is Bingham’s 93rd season. Finals record: 9-2 (.818). Last championship: 2014. Playoff record: 57-34 (.626), 44th playoff appearance. Coach: John Lambourne is 24-2 (.923) in his second year with the Miners. He’s 64-17 (.790) in seven seasons overall, including 40-15 at Hunter (1994-98). Playoff record at Bingham: 5-1 (.833), second appearance. He’s 10-6 (.625) overall in seven appearances, including 5-5 at Hunter. First championship game. Opened in 1997; 20th season. Finals record: 1-3. Only championship: 2011. Playoff record: 29-16 (.644), 18th playoff appearance. LP only failed to qualify for the tournament in 1997, its first year, and 2007. Coach: Mike Mower is 38-12 (.760) in his fourth season, since 2013. Playoff record: 8-3 (.727), fourth appearance. Extra Point 1: Bingham and Lone Peak rank first and second in victory margin in 5A, but the Miners win by an average of 33.0 ppg while the Knights prevail by an average of 24.8 ppg. Extra Point 2: Bingham is 61-7 over five seasons, from 2012 through last week. Three of those seven losses have come to out-of-state teams, one was to Alta, one to Syracuse and two to Lone Peak. Meanwhile, Lone Peak is 49-11 over the same time frame. Extra Point 3: A Bingham championship gives the Miners a 14-0 record for the third time in school history, matching the 2006 and 2013 teams. Bingham is the only schools to win 14 games twice. Hunter (2003), Juan Diego (2008), Logan (2011), Lone Peak (2011) and Timpview (2014) have each posted state-high 14-0 records once. East joins the group with a victory in the 4A title contest. Extra Point 4: Bingham shoots for its fourth undefeated season – the other three came in 2006, 2010 and 2013. Extra Point 5: Bingham celebrates its fifth consecutive double-digit win season, its 11th in 12 years (since 2005) and its 12th in school history. Extra Point 6: Bingham’s John Lambourne is the winningest active coach (min. 5 seasons). Extra Point 7: Lone Peak enjoys its second consecutive double-digit win season, its fifth in seven years (since 2010) and its seventh in school history. Extra Point 8: Lone Peak is averaging 58.7 points-per-game in the playoffs. That’s just ahead of Tooele’s 57.0 ppg, the state record set in 1928. Extra Point 9: Fifty-eight teams have ruined another team’s perfect record in a championship game. Lone Peak attempts to become the 59th. Series history: These teams first met in a 1933 non-region game, which East won 21-0. They battled in the Class 4A first round in 1997 and 2006, with East capturing both contests. Last year, East doused the Red Devils 42-14 in the semifinal round. Series record: East leads 4-0. Coach vs. coach: East’s Brandon Matich is 1-0 vs. Springville’s Willy Child. Current winning streaks: East, 22 (longest active streak and tied for 14th longest in state history); Springville, 12 (third longest active streak). Opened in 1914; 103rd season. Championships: 17 – comprised of 13 victories, one title in 1917 when season records determined the state champion, one in 1925 when both semifinal games ended in ties and all four semifinalists were named champions, one in 1926 when East tied Box Elder in the title contest and one in 1943 when East and Davis won semifinals but Davis refused to play in the Class A championship game because of a bracketing change. Both were declared champions. Finals record: 13-4-1 (.778). Last championship: 2015. Playoff record: 59-27-2 (.682), 44th postseason appearance. Coach: Brandon Matich is 67-22 (.753) in his seventh year, since 2010, at East. He’s 105-40 (.724) overall including 39-18 in five seasons at Park City from 2005-09. Playoff record at East: 17-5 (.773), seventh appearance. He’s 21-9 (.700) overall in 11 appearances including 4-4 at Park City. Championship game record: 1-2, at East. Played two seasons in 1908-09, then for good starting in 1919; 100th season. Finals record: 1-3. Only championship: 1985. Playoff record: 28-44 (.389), 46th postseason appearance. Coach: Willy Child is 38-18 (.679) in his fifth season, since 2012. Playoff record: 5-3 (.625). First championship game. Extra Point 2: Over the season, East and Springville rank first and second in victory margin in 4A, but the Leopards win by an average of 32.8 ppg while the Red Devils prevail by an average of 24.8 ppg. Extra Point 3: East plays in its 19th championship game. Only Millard (21), Beaver (20) and Skyline (20) have appeared in more. Extra Point 4: East is the fourth winningest playoff record by percentage (.682), behind Juan Diego (.786), Skyline (.740) and Timpview (.739). Extra Point 5: East is on a 22-game winning streak, the 14th longest in state history. But it’s not the longest in East’s school history; the Leopards won 24 in a row from 1955-57. Extra Point 6: East (13-0) has equaled its record for best start and most season victories, achieved by the 1996 and 2013 Leopards. With a win, East becomes just one of seven schools to capture 14 victories in a season. The others: Bingham (2006, 2013, 2016? ), Hunter (2003), Juan Diego (2008), Logan (2011), Lone Peak (2011), and Timpview (2014). Extra Point 7: East hopes to rack up a perfect season for the eighth time in school history and for the first time since 1996. Only West, with nine, has more. Extra Point 8: East enjoys its second consecutive double-digit win season, its fourth in six years, and its 11th in school history. Extra Point 9: East has scored 646 points this season, the fourth-most in state history and 47 points shy of the state record held by – who else? East, in 2013. Extra Point 10: Springville (12-0) has matched its record for best start, most season victories and longest winning streak, all originally set by the undefeated 1985 championship team. That year was the Red Devils’ only unbeaten campaign. Extra Point 11: Springville celebrates its second consecutive double-digit win season, its fourth in eight years, and its sixth in school history. Series history: Although Desert Hills opened in 2008, these two St. George schools didn’t meet that year. But they’ve tangled as region foes every year since and twice in 2013 when Desert Hills defeated Pine View for the Class 3AA title. PV won the first two encounters (2009 and ’10) and the 2013 region game, but DH has taken the other six, including the last four in a row. The Thunder swamped Pine View 36-19 during Week 8 (Oct. 7) at home. Series record: Desert Hills leads 6-3. Coach vs. coach: Desert Hills’ Carl Franke is 5-1 vs. Pine View’s Ray Hosner. Current winning streaks: Desert Hills, 4; Pine View, 4. Opened in 2008; ninth season. Finals record: 1-1. Only championship: 2013. Playoff record: 13-7 (.650), ninth postseason appearance. Coach: Carl Franke is 43-15 (.741) in his fifth season, since 2012. Opened in 1983; 34th season. Finals record: 0-5. Playoff record: 24-24, 25th postseason appearance. Coach: Ray Hosner is 134-50 (.728) in his 16th season, since 2001. Playoff record: 22-13 (.629), 14th appearance (missed only in 2006 and 2011). Extra Point 2: A Desert Hills victory rewards the Thunder with their third double-digit win season and first since 2014. Extra Point 3: Pine View has secured its first double-digit win season since 2008 and its fifth overall. Extra Point 4: Desert Hills’ two losses were to 5A’s Jordan in the season opener and to region foe Dixie. Pine View lost to Dixie and Desert Hills. Three championship games ended in ties (1924, 1926 and 1943 [Class B]), so two teams got trophies each of those years. The 1925 semifinals ended in ties and all four teams involved were awarded trophies. Twice, in 1928 and 1943 (Class A), the semifinal winners refused to meet in the championship for various reasons and so the semifinal winners were declared state champions. So that’s 287 championship-game winners, plus six teams that tied in the state finals, plus the four teams that tied in the 1926 semifinals, plus the four that won semifinals but didn’t meet in the finals, plus the 21 that were state champs based on their season record – making 322 champions. Want a couple more complications? Playoffs and championship games were supposed to start in 1918, not 1919, but the Spanish Flu ended the ’18 season after the first week (and just five games) had been played. And the 1942 playoffs were affected by World War II. In October of that year, the tournament was cancelled to support fuel conservation. Thus, there were no state champs in 1918 and 1942. Note: While this is the final week of the season, Felt’s Facts will have a wrap-up edition next week highlighting the teams and individuals that have made their way into the Top-20 all-time rankings in various game, season and career categories. Plus, one lucky state champion will be selected in mid-December to play in the Geico State Champions Bowl Series on Dec. 23. That game, to be played at The Ford Center, home of the Dallas Cowboys, will pit the Utah selection against a championship team from Arizona, Florida or Georgia (see www.geicobowlseries.com for more information).